Highlights for us would be the Royal Street Stroll on Thursday which combines jazz, art, antiques, wine and food for an evening of tasting and shopping. 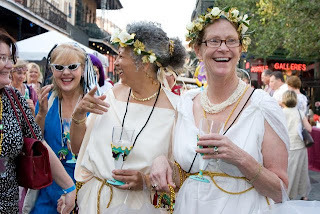 We're not sure why these ladies were wearing togas at a previous year's stroll; but it looks fun! The Riedel seminar: we did this on the Oasis cruise a couple of years ago and Max Riedel taught me that size and shape make a difference, in wine glasses that is. 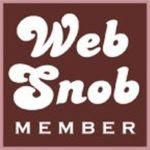 Wine Lovers Musical: we're strangely curious about this audience participation show that combines wine tasting and musical numbers. Stay at the Hotel Montelione where Anne stayed for "Tales of the Cocktail" or the W New Orleans, because we always have a fun time at a W.
Men and Short Hair: What Do They Really Think? Memorial Day Travel Idea #4: Charleston, S.C.